Mobile home insurance is a necessary expense for people who live in or rent out their mobile homes. It protects you from sustaining monetary losses in the event that your property and personal belongings are damaged as a result of inclement weather conditions, fire, burglary or theft. In order to locate the most affordable policy that best suits your needs, it is imperative to be aware of the types of coverage available and the factors providers consider when determining premiums. Insurance specifically designed for mobile homes is different than traditional homeowners insurance, which is appropriate for permanent structures and modular homes. Mobile home insurance protects you from paying out-of-pocket for costly repairs or the total replacement of your mobile home. Look for insurance coverage that will help you stay out of financial trouble when unexpected events occur. Is AARP Homeowners Insurance Right for You? If your mobile home is damaged as a result of a covered event, such as a windstorm or vandalism, the insurance will cover the costs of the repair minus the deductible. This means that you are responsible for a certain amount of the repair costs, up to the amount of the policy deductible you have chosen, and then any remaining amount needed for the repairs will be covered by your insurance company up to the policy limits. If your mobile home is damaged to the point of being deemed a total loss, or if your mobile home is stolen and not recovered, your insurance policy will cover the cost of replacing the mobile home less the amount of your deductible. The amount of money you will receive for the replacement of the mobile home depends on the value of the mobile home as well as the amount of insurance coverage you originally obtained. 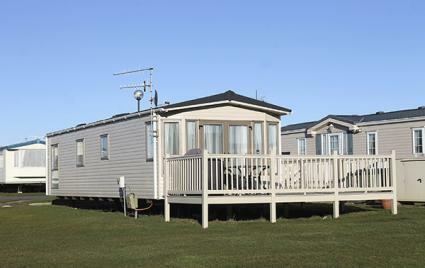 Some of the items within your mobile home may be covered under your insurance policy. More than likely you will need to purchase additional personal property insurance if you keep items within your mobile home which are high in value, such as expensive jewelry or electronics, but your regular mobile home policy should cover other personal property items which are kept in your mobile home. If a visitor to your mobile home -whether invited or not- is injured, you may be liable for any medical bills or other expenses related to the injury. This can result in huge expenses that can cause a large financial burden. Adequate insurance will cover these costs up to the maximum liability coverage provided by the policy. Not all home insurance policies include flood insurance, but this does not mean that you should skip this important coverage. Talk to your insurance provider about adding flood insurance to your policy to make sure your mobile home is covered. There are some types of coverage that you may want to add depending on the geographic area of your mobile home. For example, additional earthquake insurance might be purchased by a mobile home owner in California. A good rule of thumb is to figure out what your mobile home may be particularly susceptible to, and then make sure you have adequate coverage. The cost of your mobile home insurance premium will depend on the coverage options that you select. Start the search by reaching out to your insurance agent to inquire about coverage options that they may offer. Also, use online quote generators to locate companies that can provide quotes for mobile home insurance policies that best suit your needs. Websites such as TopHomeInsurance.com provide standard quotes from the top providers in the industry based on your specific needs. AMIG is the leading provider of mobile home insurance with over 1.7 million policy holders. They have offered this type of coverage, which is the center of their business, to consumers since 1945. Geico is known for their streamlined application process and 24/7 customer service. They have been in the insurance industry since 1936, and possess over $28 billion in assets. Progressive tailors policies to their customers based on the customer's budget. With over $14 billion in assets, they are financially stable and offer 24/7 customer services to attend to all of your mobile home insurance needs. Allstate was founded in 1931 and currently serves over 16 million households. Their net assets are $126.9 billion, and they offer flexible mobile home insurance options to those seeking coverage. Many other major insurance companies offer this type of insurance, so be sure to obtain quotes from more than one company so you can find the best coverage at the best price. When shopping for mobile home insurance, it is essential that you research all of the benefits that the potential provider can offer you. They should be able to provide you with a competitive rate for mobile home insurance that entails exactly what you are looking for in terms of coverage, meets your budgetary needs, and offers the best value for your dollar. Inspections gauge the condition of your home and the likelihood of severe weather damage. Once the final report is complete, the inspector should be able to provide you with a list of recommendations that will improve the quality of your home and reduce your level of susceptibility to property damage. Security systems and other components, such as reinforced doors and dead-bolt locks, that help protect your home from theft and burglary reduce your level of risk from the provider's perspective, and may result in a price break on your premium. Location is also an important factor in the mobile home insurance arena. Those properties located in areas that are established with a low rate of crime and excellent school district are typically the ones that are quoted the lowest rates. Discounts are offered by select providers to policyholders for various unique reasons. These include those who are multi-policy holders, senior citizens, or members of professional associations. Don't make a snap decision when it comes to selecting a policy for your mobile home. Make sure the policy is suitable to your needs and will provide you with the coverage you need.